And so the day finally came, the all new Daredevil #1 is here! And all I can say is that Mark Waid, Chris Samnee, Javíer Rodríguez, Joe Caramagna, and Ellie Pyle completely hit it out of the park. This first chapter of Matt’s adventures in San Francisco was so outstanding that after I’d read it, I simply tweeted an image of the Cookie Monster grinning from (non-existant) ear to ear. That was somehow the best I could do to express the sheer giddiness I felt while reading this story. This issue was so good, in fact, that I don’t quite know where to start. Part of me would feel content to just yell “COOKIE! !” and let that serve as my review, but I think this issue deserves a better treatment than what you’d get from a Sesame Street character. So, here’s what I’m going to do: At the very end of this post you’ll find a list of some of my absolute favorite moments from this issue. For the proper review portion, I’m just going to start with the gorgeous two-page spread you see below, and work my way up from there! These two pages above took my breath away. This is what happens when Mark Waid’s words, and Chris Samnee’s line art make a love child that they dress up in the Eye-Popping collection by Javier Rodríguez (and don’t you wish that were an actual collection?). Not only am I vividly reminded of the collaborative nature of comics and the way each part of this spread, down to Joe Caramagna’s fantastic lettering, can give rise to something that is so much more than the sum of its part. It is also a testament to what it is about their run that has made it such a fan favorite. From the technical side of things, there’s the intriguing balance of the two sides. The circles are clearly meant to evoke Daredevil’s famous radar sense, but looking at the two pages next to each other, they also look a little like a pair of eyes. 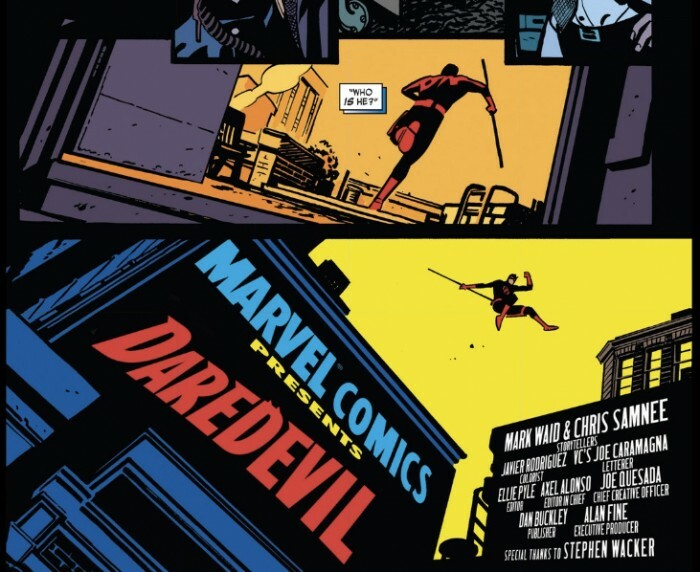 The first page, featuring Daredevil – as we see him – allows us to look into his past, as Waid and Samnee together manage to put together a recap page that feels truly fresh and innovative. 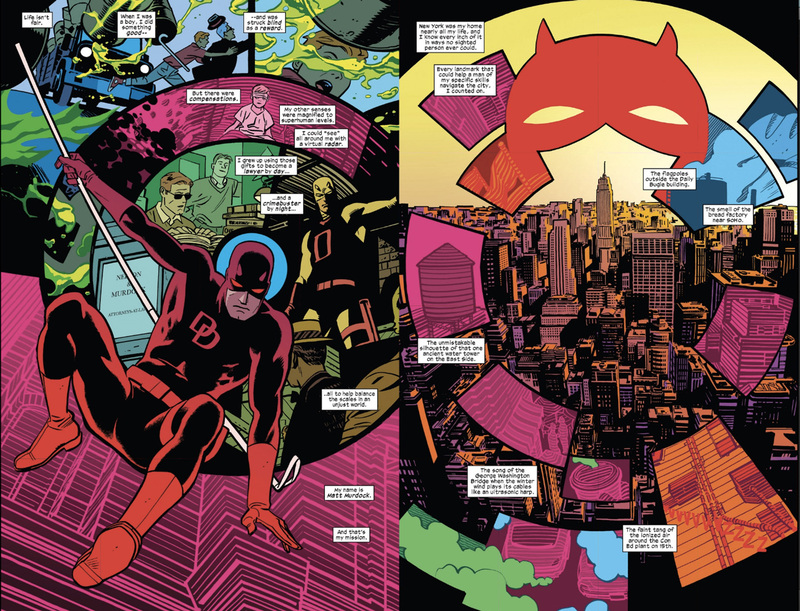 On the second page, we move to the present day and to Daredevil’s perspective as it is superimposed on an absolutely breathtaking and intricate view of New York. When the people in my life who don’t know anything about Daredevil ask me why I feel so strongly about this character, I can now point to this spread. This is the essence of Matt Murdock. Yes, I’m gushing here, but these pages alone are worth the cost of admission, many times over. 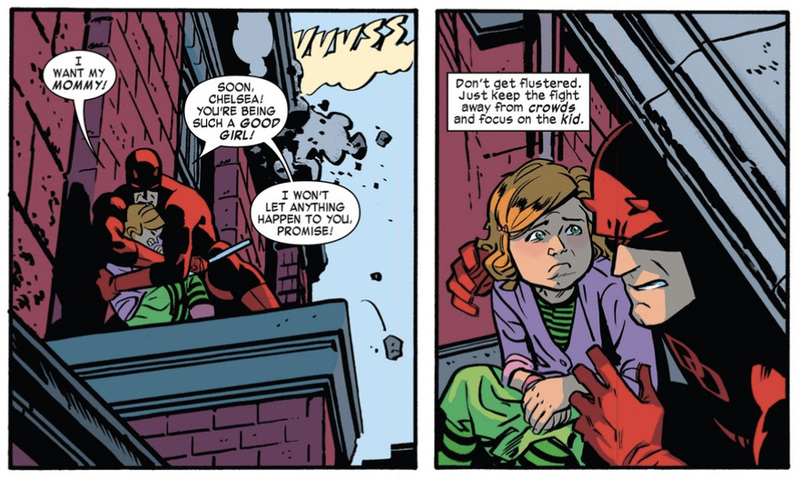 Through his writing, Mark Waid reminds us of why he gets Daredevil like no one else. He pulls us into Matt’s way of thinking and perceiving, and in so doing provides the perfect starting point for Matt’s new life in San Francisco: “New York was my home nearly all my life, and I know every inch of it in ways no sighted person ever could.” For Matt, moving to a new city isn’t as simple as just relocating. In many ways, he is starting over from scratch, tasked with having to build a new understanding of his surroundings. Daredevil’s relative unfamiliarity with San Francisco runs like a common thread through the entire issue, as he dedicates himself to a complicated kidnapping case which requires the attention of both his costumed and civilian identities. This is the first time Matt is able to act openly as Daredevil, but this is not where the emphasis for this issue lies, although I’m sure we will return to the complications of Matt’s new status in the coming months. The story at the center of the issue – the rescue of a young girl, the daughter of deputy mayor Charlotte Hastert (whom I’m certain we’ll meet again) – is interesting in and of itself. The interplay between Matt and little Chelsea is quite touching, whereas Kirsten provides both assistance and comic relief. As has been the case since day one with this creative team, they also never pass up an opportunity to add meaning and important character moments along the way. I’m almost always impressed with the pacing when reading an issue of Daredevil, but this issue was exceptionally good in this regard. I even had to double-check that it wasn’t longer than a standard issue, because it felt like such a solid, jam-packed read. Samnee’s story-telling prowess contributes a great deal to this general sense as he is both economical in his approach to a panel yet highly skilled at loading it up with just the right kind and amount of information. I could certainly go on, but instead I’ll just cut to some of my favorite moments, which highlight different aspects of this phenomenal start to a new exciting chapter in Daredevil’s history. Did you guys notice that Chelsea has two moms? And that they didn’t make a big deal about it because it shouldn’t be a big deal? And that I am now inadvertently making a big deal about them not making a big deal of it? Hmmm… Joking aside, I loved this. To everyone involved, thank you! This doll is just too cute. And there’s nothing to add to that really. Damn, this is so cinematic and a great riff on something I can’t quite place. Either way, a great way to sneak the credits in there. Kirsten is quickly becoming the perfect comic relief character. In the sense that she is so much more than that, and also because I just love her sense of humor and dry “everywoman” observations. She may be in over her head in Matt’s world, but she certainly isn’t afraid to step up. To the keyboard, in this case. Yup, another Kirsten moment. This one made me chuckle. For some reason, I forgot to post this yesterday. Anyway, I thought the way Matt comforted Chelsea was really sweet. We don’t get to see him interacting with children that often, but it’s usually pretty heart-warming. From Kirsten’s expression on the left, to the perfectly choreographed acrobatics on the right, this was just one of many panels Chris Samnee nailed this issue. Kirsten is absolutely shameless when it comes to pulling a fast one on her blind boyfriend and I, for one, love her for it. Besides, someone has to keep that man’s ego in check. That’s it folks! What did you think of this issue? Solid issue from Waid and co. I can’t say anything you haven’t already about Samnee’s art which continues to impress. I say solid because other than the art, this issue didn’t really impress me more than any other random issue by Waid. It was in no way bad, but i wouldn’t even place it in the top 10 or 15 issues Waid has written. Not to make a big deal about it, but this was just issue 37. There was absolutely nothing about this that justified the need for a new volume and price. That was just Marvel being Marvel. Whatever. Thats the industry now. It just stands out in contrast to something like X-Factor which kept the same writer in its relaunch but was a totally new direction and setup for the book. The only thing new is DD’s in San Francisco after a rushed ending to the Serpents arc to get him there for the relaunch. The earpiece with Kirsten helping him was cool and made the chase extra awesome with her in his ear. I wouldn’t mind if that concept stuck around for a while, but I would think it become a liability the way it messes with his ears. Also “The Sign” made my eyes roll. 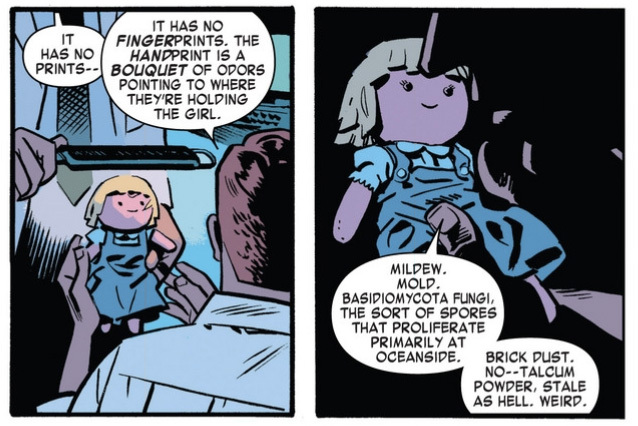 Sorry to be blunt, but Waid and co. went for the very, very cheap laugh with that. 1) It makes Kirsten look childish and unprofessional. 2) Matt would know she was lying about it. 3) It makes their practice look questionable and unprofessional to potential clients to have their entrance be a childish joke. I loved it. I, too, see the story as a throwaway Adventure but it was a good way to start this new chapter. Awesome pacing. I loved the scenes at the beginning show casing all of Matt’s different heightened senses. I sometimes focus too much on his radar and hearing and forget about smell and touch. What about that ending, though? Will you be writing a more spoilery post to share your thoughts on that? Great issue, I enjoyed it. Not sure what is happening at the end? Is that Foggy in the urn? If not, is the bald guy Foggy? And how is he watching the office? Has Foggy got the Hank Pym treatment? It is very creepy. Christine, does that “sleep move” on the little girl not qualify as “he did it again”? 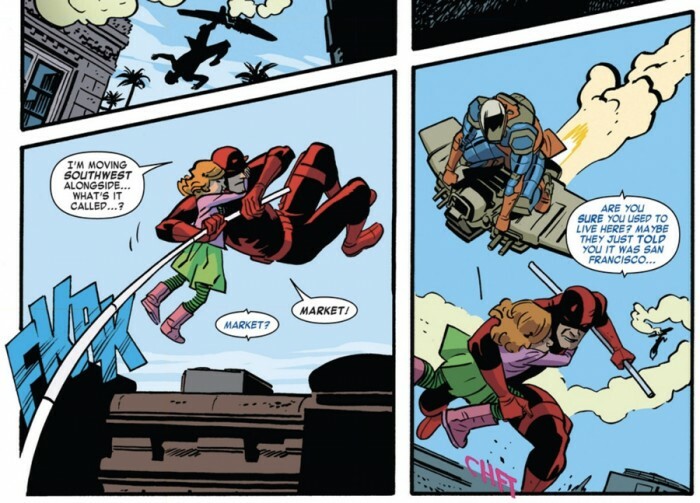 Waid made Matt knock out a little girl and got away with it! Respekt! 1) I agree that renumbering is “stunty,” and I don’t really think of this volume as “all new” as much as a new chapter that easily could have been #37 (even though there are at least big changes that motivate a renumbering for a company that has already decided to renumber). The renumbering also has some benefits for getting new readers who don’t like jumping onboard in the middle of a series’s run, regardless of how accessible it is, so there is that. As for the new price point, this is one of few comics that feels like it gives you value for money and more. 2) Having said that, I try to keep things like that out of my reviews since those decisions are usually made by people other than the ones who write, draw, and color the comics. So my feelings about this issue is based on the merits of the issue. AND, I have to say (again) that I really did love this issue as much as my review indicates that I did. Last month, I was one of the (seemingly) relatively few who didn’t love Daredevil #36. In contrast, I would easily rank this issue among the top 5 since Waid began his run back in 2011. I was actually getting a little emotional writing this review. 1) If there’s enough radioactive residue on a piece of paper to deposit a noticeable (even by Matt Murdock) amount of thermal energy in your skin, then that’s clearly more than just a trace amount. It also makes me wonder why the lab didn’t use a Geiger counter. I’m not sure if that’s standard in a forensics lab, but since they claimed they’d examined from every conceivable angle, it’s a strange omission. 2) I don’t get why Matt should be able to detect radiowaves (which, like light, is a form of electromagnetic radiation, and usually passes right through a human body). He’s done that in the past, but that doesn’t mean that it makes sense. Still, I didn’t want to mention these reservations in my review, because they are such minor nitpicks compared to how fantastic this issue was generally. And for the record, I still think the sign on the door is funny. It is just a joke, and I wouldn’t be surprised to see his name in larger print in coming issues. And, Kirsten doesn’t actually have to lie when she assures him that his name is on the door, especially if she’s sufficiently cool about it not to give off a nervous vibe. The relaunch is, as we say in the Bay Area, hella good. Looking forward to my downtown BART stop showing up in DD soon. 415 represent! Is it ironic that a book about a person who can’t see has such richly kickass colors? Javier, I tip my SF Giants cap to you. And while it has nothing to do w/ the issue, this blog post about overcoming blindness and depression through music and friendship is awesome: http://www.bhorowitz.com/the_legend_of_the_blind_mc (The Legend of the Blind MC). Not a doubt in my ind that Matt Murdock would approve. “Not to give off a nervous vibe’? Sorry. I don’t buy that. Unless a a pacemaker is involved or a person can control their heartbeat like a ninja (Matt or Elektra) or a super spy (Natasha), Daredevil’s “lie detector” has been shown to be pretty impossible to beat. Thats one of the very few constant and consistent things from throughout his history. If you are a normal person you can’t lie to Matt Murdock. 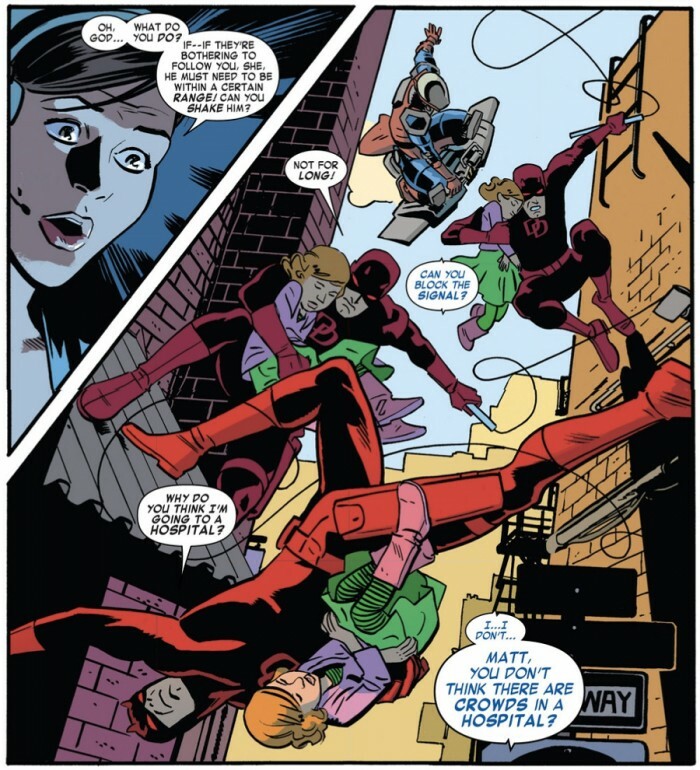 If the next issue the sign is “normal” and maybe Matt was just playing along, thats cool. If not, then for that scene he (Waid) sacrificed character in favor of a cheap joke. Again though, I don’t in any way think this was a bad issue. 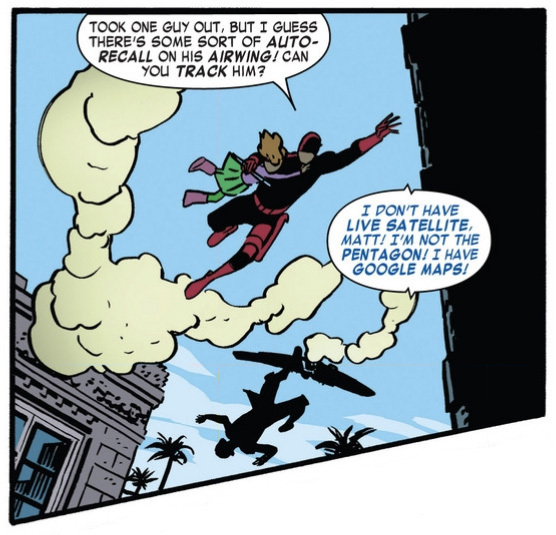 A “solid” issue by Waid is still better than 95% of whats being published. As for the “former” partner thing, it could be as basic as Foggy needing to pass the California bar and not being clear-headed enough to study. As soon as he passes, it will be (I’ll use alphabetical order for now) McDuffie, Murdock, and Nelson, but meanwhile, they had to put SOMETHING on the door. I dunno. Guess we’ll find out shortly. Darn. No, I did not notice that Chelsea had two moms. Thanks for pointing that out Christine! I thought this was a solid start to Matt’s new life in San Fran. While Kirsten’s role here may seem odd, I can see Matt’s reasoning for this initial arrangement. A set-up for a new mystery (kidnapping a little girl and implanting a bomb in her is a rather despicable act if you think about it). The banter between Matt and Kirsten was especially good. Samnee delivers yet more excellent work here. I can’t say anything else beyond what you have mentioned about that two-page spread other than I agree with you completely. I think it should be quite apparent by now just how well a handle Waid has on Matt’s character and characterization. Samnee’s chase scenes were frantic and exciting. And the idea of Matt being something of a Hero for Hire seems very intriguing. The numbering and price change may seem unnecessary but this creative team is still delivering one of the best comics on the shelves today. Great issue, great intro to San Fran! I don’t believe this is a one off story as some suggested. There’s still the mystery of the actual kidnappers to explore. The who and why’s have to be answered. The joke on the door is just that a joke. Waid gets DD’s character well enough I think it’s safe to assume Matt knew Kirsten was joking with him. Matt is humble enough not to let something that minor perturb him. The price point and re numbering is Marvel thing not a Waid’s. Even if it was, who cares. I stopped caring about numbering years ago. I look for solid story telling, the numbers just let me know what’s issues to grab and order to read. Great review!